First off I want to thank every single one of you. I know lots of you donated money to help my nephew and my sister was so grateful. She used the money for gas and paying some medical bills. Tanner has had a couple of surgeries on his face and that seems to be healing well. His leg was missing 4" of his femur bone (might be more) that they later found in the bumper of the car. His leg has been really difficult and many surgeries later he still has a shorter leg. He is having another surgery on his femur this holiday break and so I thought I should hurry and finish the quilt that I started awhile ago for him. It is getting closer to winter and really cold season especially where Tanner lives and I hope the quilt will help keep him warm as he is recovering. 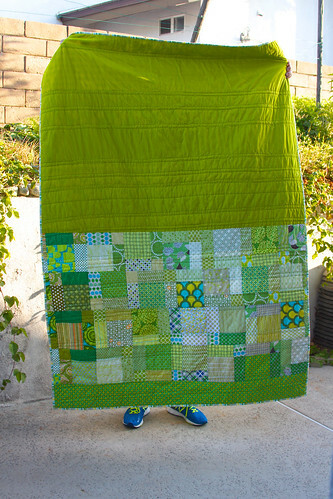 His favorite color is green so I decided to just go all out and make the whole quilt green. I did a simple strip quilt since I thought that was manly. The quilt finished at 60" x 83" perfect size since he is six feet. The back I used Kona Chartuese along with the nine patch blocks that I had first started to make for his quilt but then decided I didn't want to make his quilt with nine patches. 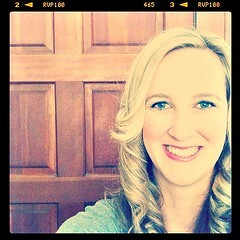 Thanks to Christina for sending me 2 blocks that I used they were perfect! I didn't get a close up of the binding but I used a Heather Bailey Nicey Jane dandy stripe that Barb sent me just for this quilt. Thanks again sooo much for that Barb! This is why I love the sewing community so much. 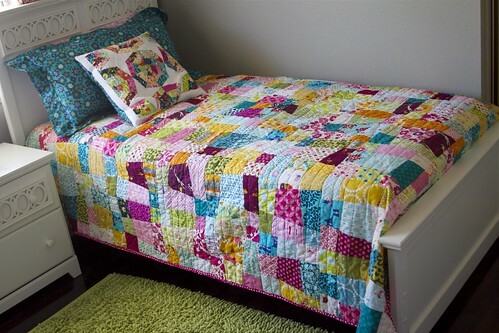 I mailed the quilt off yesterday and if I can get a picture of Tanner with it I will come back and add it to this post. Again thanks for all the love peeps! 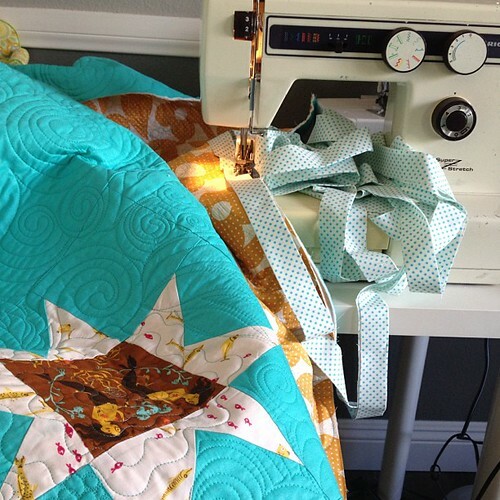 Hopefully I will be back to quilting and blogging here. 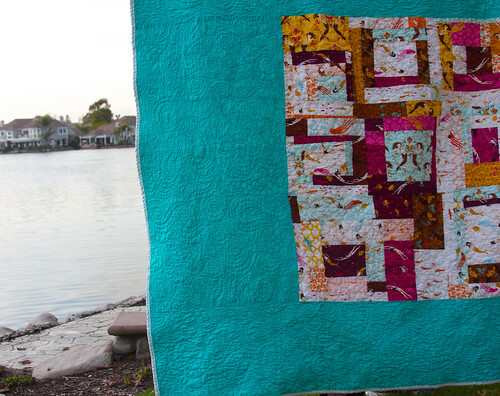 I have more quilts to share. My Nephew needs your help! 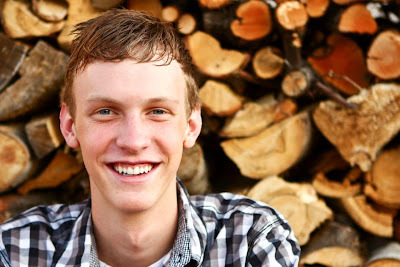 My 18 year old nephew, Tanner Olsen, was hit by a car in Cedar City, Utah,on Monday December 10th. He was life flighted to Las Vegas, Neveda and is still undergoing treatment for a smashed femur and multiple broken bones in his face. The broken femur will require approximately 4 - 5 surgeries and it will be more than a year before he is able to walk. He will also require many reconstructive surgeries to repair his face. Insurance is not going to cover any of this medical expenses. I have set up a Fundraiser to help his family with the medical expenses. 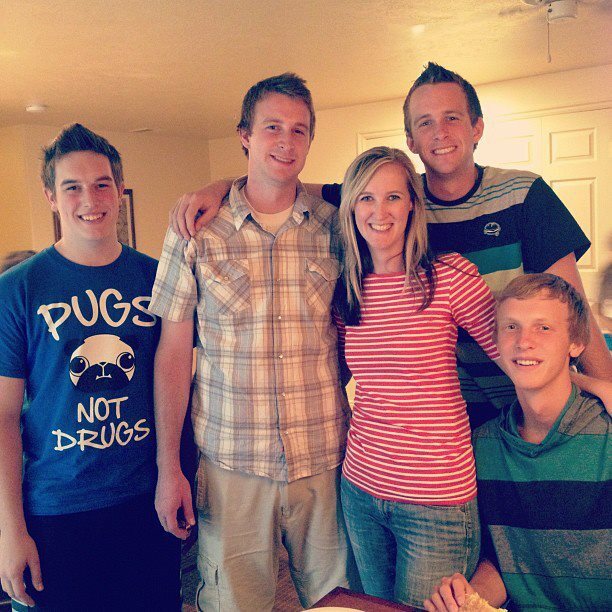 The Tanner Olsen Fund . If you can donate anything that would be really amazing and helpful to my sister and her family to pay for all the medical expenses. 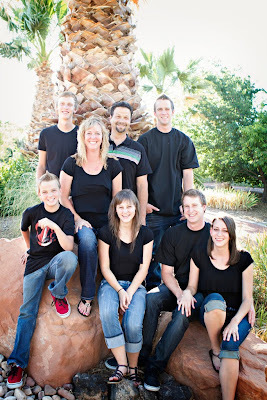 They live in Cedar City, Utah, and are with him in Las Vegas almost 200 miles from their home. If you are willing to spread the word that would be amazing. Please keep my nephew, Tanner, in you prayers and his family! Thank you everyone for being so awesome. 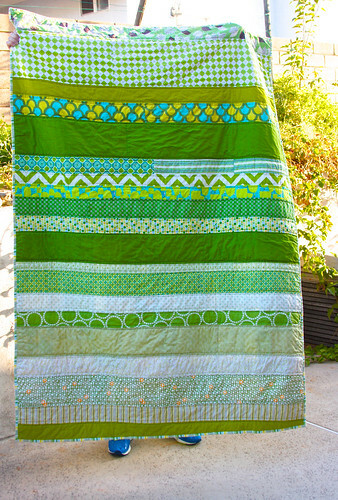 I have had this quilt finished for awhile but sent it out to an amazing long arm quilter my friend Christina since there is so much solid I didn't want to quilt it. You would see all my mistakes. I knew this quilt would by my favorite out of all of mine and I wanted it quilted special and Christina does crazy amazing work! 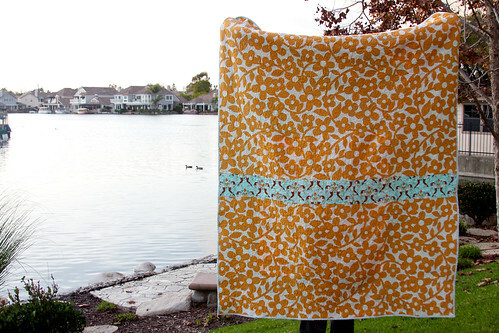 Ever since I made Gwen's Mendocino quilt almost a year ago I knew I had to make myself one. I kept stealing hers. The solid I used is Micheal Millers Cotton Couture in Luna. If you haven't yet used this solid it is so soft and I highly recommend it. 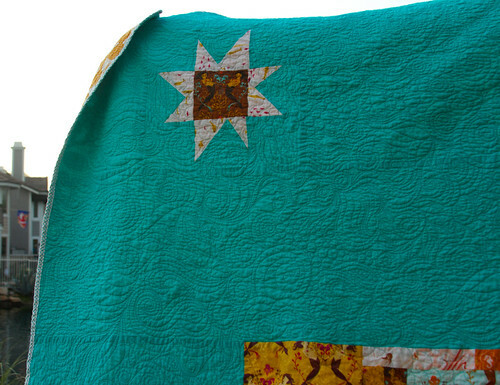 I loved Gwen's quilt where I used the aqua solid as sashing. It was just so fun and went great with the mermaids since it made it look like they were swimming in the ocean so I knew I had to use it for mine. 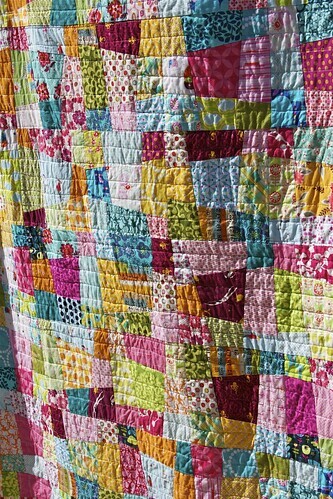 Plus it would really make the quilting stand out. Isn't Christina's work just amazing???? She blew me away with this one. For the back of the quilt I told myself this was my favorite fabric line and that I might as well go all out so I used the last bit I had of the aqua mermaids along with Erin McMorris Weekends print which is such a great compliment to Mendocino. For the binding I used Riley Blake, Happier dot. It is such a fun great print. I owe all these great "site" picture to my husband who went with me to the lake by our house and held the quilt up so I could take these pictures. It was the first time I convinced him to go on a quilting picture adventure with me but really he just wanted to go running around the lake and I just tagged along. The quilt is 66" x 84" which is just perfect for my since I am really really tall. 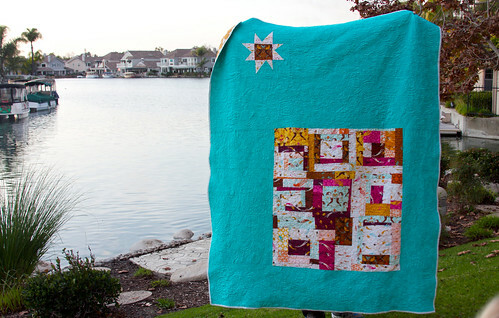 I doubt this quilt will be far from me this winter. I always have a quilt around me since I am always cold. 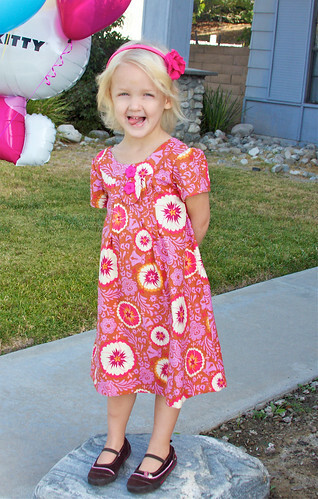 Penelope's 3rd birthday was coming up soon and I knew I wanted to make the Family Reunion Dress by Oliver + S. I knew if I made Penelope one I would have to make Gweniveve one too so I ordered each of them fabric that they would love. 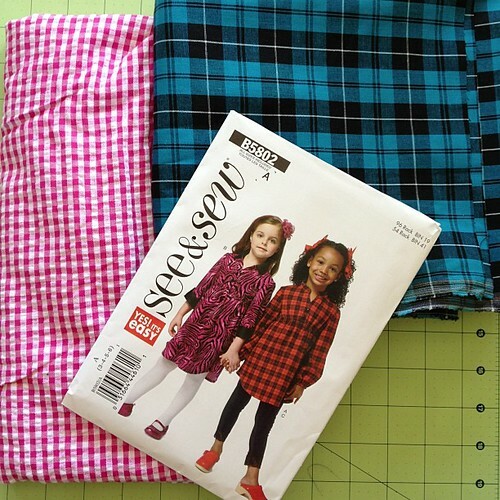 Gweniveve of course loves blue and Penelope is a pink or purple girl and I found that Anna Marie Horner fabric was on sale so I bought the pattern and the fabric at the same place. 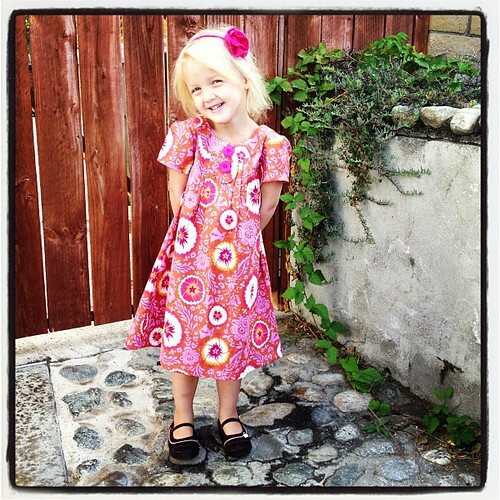 Gweniveve's dress is Anna Marie Horner, Loulouthi, Summer Totem fabric. 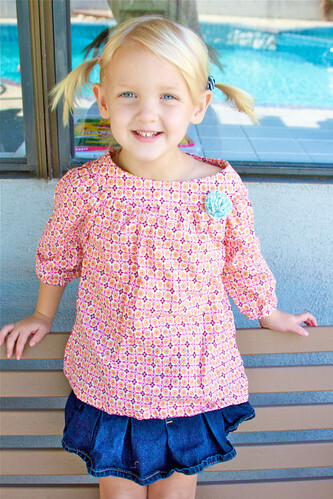 Penelope's is Anna Marie Horner, Innocent Crush, Bubble Burst fabric. On each of the dresses are zippers and not the buttons in the back. Penelope's was rather large and I didn't want to fix it so I gave it to Gwenieve since it fits her perfectly. For some reason this pattern is dead on in size where the Ice Cream Dress runs small and I was going off of that pattern more. Oh Well. 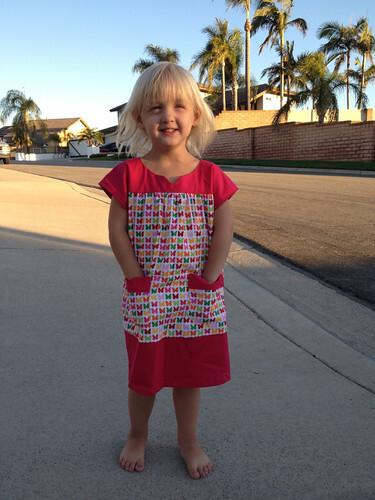 This just meant that I needed to make Penelope another dress. Here is the 3rd and final Family Reunion Dress. 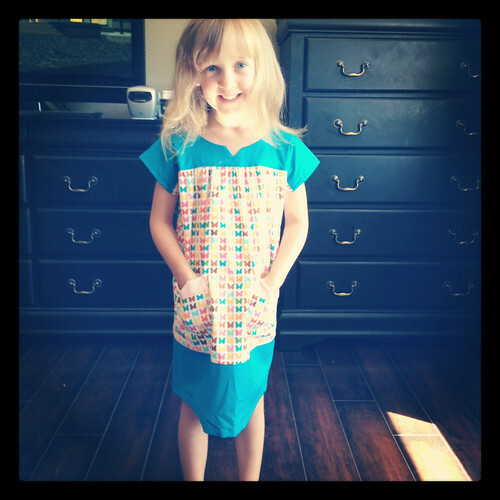 It is a 3T on the pattern I just made it longer since my girls are so tall. 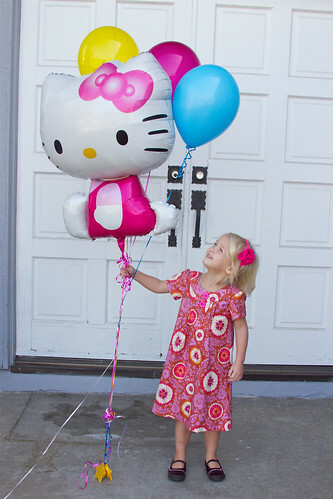 Penelope loved it and it was a very successful birthday! 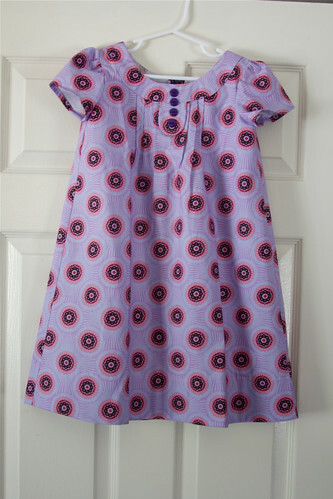 Back in June the girls also had the Ice Cream Dress which was made with Kona solids and Remix by Ann Kelle. I only have pictures from my phone but that is better than nothing right??? Gwen's of course is blue. Penelope's pink. 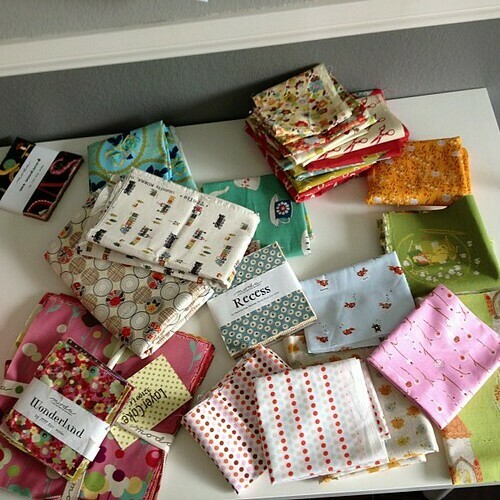 I started a Destash of fabrics over at my etsy. Here is the link. 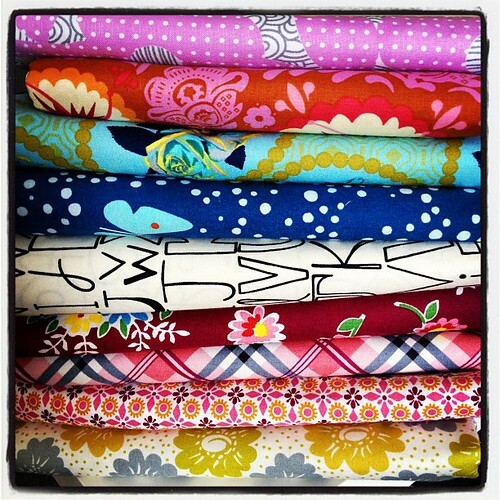 Here are just some of the fabrics. I will be listing more on Monday so keep checking. Also I didn't take a picture of all the fabric this is just some of them. Thanks everyone! I finally joined this time! Day 1 I pulled fabrics and plotted. 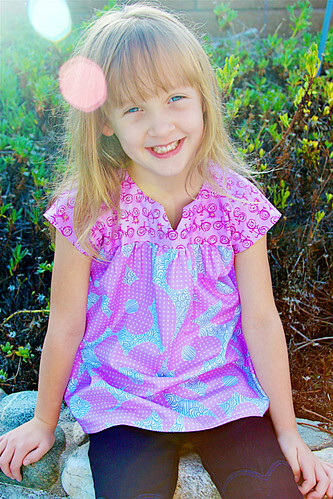 Day 2 Gwen needed a purple shirt to wear to school for wear purple day. 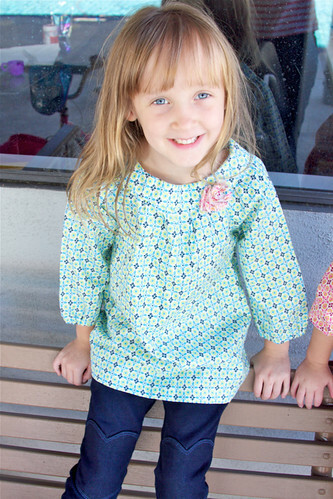 I used Oliver + S Ice Cream dress pattern but made the shirt. 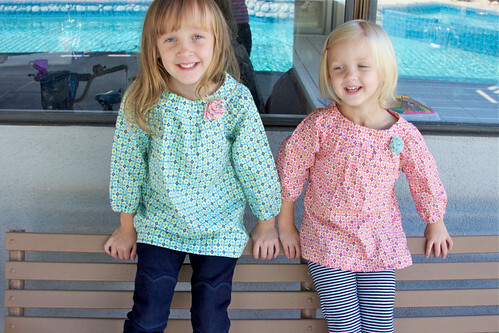 I used Erin McMorris fabric line Weekends it is one of my favorites plus Gwen approved. She loves it. Day 3 I remembered these shirts my Mom figured out from a shirt Gwen had from Carters because my Mom is amazing like that and can make patterns. It is a round collar and a raglan sleeve. Since my mom isn't here anymore and I want to make more of these I am going to go to JoAnn's and find a pattern I know there is one out there. This style of shirt has been around forever. I found a pattern for the shirt. 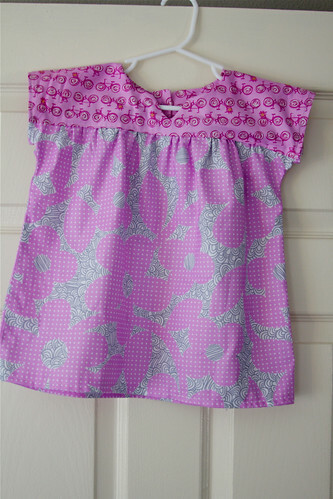 Use Kwik Sew #K3905 Shorten the pattern for a top instead of a dress and lengthen sleeve & add elastic to the end of the sleeve. 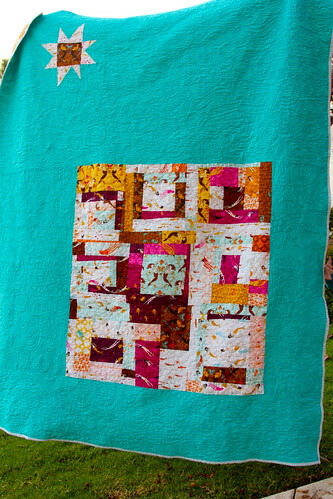 I used fabric from Denyse Schmidt line DS Quilts Collection, Aunt Eda line (I think?). 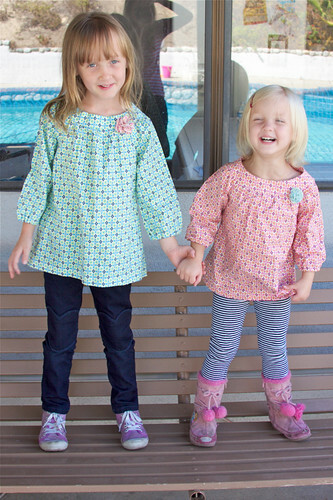 Gwen loves blue & Penelope loves pink and/or purple so they were perfect. Sisters are so fun! 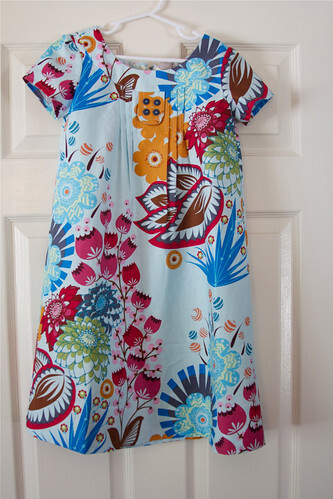 Next up is these tunic for the girls but we will see I might be losing steam. 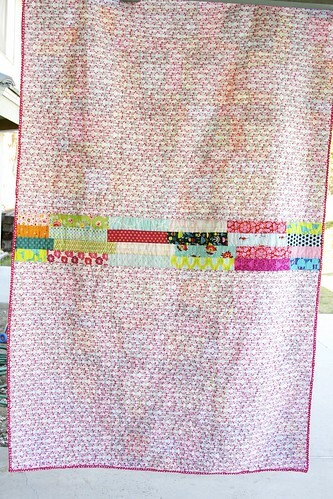 I finally finished the crazy nine patch quilt for Penelope. I used this tutorial for the blocks. I decided to make a quilt for her bed that was busy and wouldn't show anything that got on it. 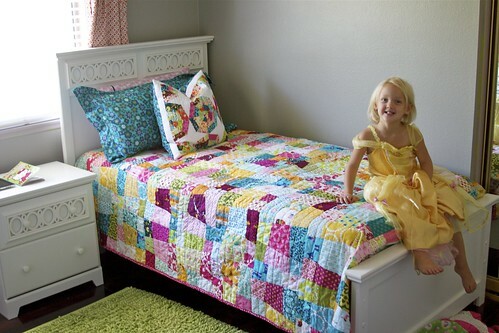 I folded and put away the park slope quilt I made for her bed until she is older. I decided the white was a little crazy for her since she is only (almost) 3. 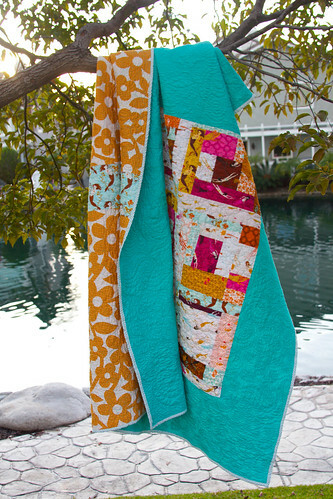 The quilt is 64" x 94" and is a good twin size. The back I used leftover scraps and also a fabric from the front which I love. It is from the line Pick a Bunch by Robert Kauffman, Loops and Daisies in Orchid. Love this fabric. It is hard to tell from the picture but it is gorgeous in real life. I did straight line quilting which didn't turn out as straight as I was hoping. For some reason this quilt was the devil to sew I think it had something to do with using my back up machine to quilt & bind this quilt. I am never doing that again. Atleast Penelope is easy & she loves it and doesn't notice all of my quilting mistakes. 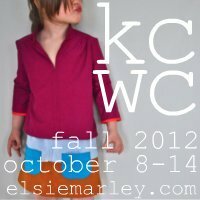 Next up is Kids Clothing Week. 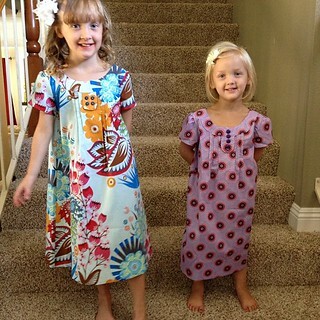 I hope to get the girls some clothes made this week!